Very popular among the more stylish homes, slate kitchen flooring is chosen for its looks and performance. It is available in many colours and shapes, giving you the choice of being creative with your floor design. Slate is quite easy to maintain and durable. Most people like it for its unusual look. The common colours used in slate flooring are black and white. Slate is a type of natural stone that is unique and when used in your flooring material, can enhance the value of your home. 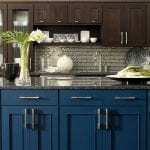 One of the biggest plus points is its ability to match practically any kind of décor, making it very easy to decide upon no matter what other options you have picked out. 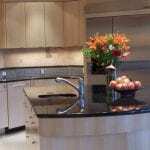 For a high traffic area such as the kitchen floor, slate is a wonderful choice. The right maintenance and care can make slate last for as long as you want. Slate kitchen flooring must be sealed to make it stain resistant. The tiles themselves are naturally slip resistant, so you will find them put to maximum use in kitchens and bathrooms where traction is a concern. For the design conscious, slate tiles can be mixed and matched to create different effects. Shapes like squares, rectangles and other custom shapes can help create a unique kitchen floor. The maximum care required to maintain slate is dry sweeping and mopping and it will stay clean and shiny for years. At least once a year, you must seal the tile flooring. A kitchen slate floor to match your countertop makes you kitchen look stylish and blends everything together well. Slate tiles are also ideal if you have radiant heating system in your home since the radiating heat will cosily warm the tiles, making them comfortable during the cold months when you need the warmth most. 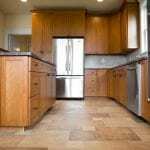 If there are children around, you need not fret about them playing on a cold floor plus it is a lot less slippery then some other types of kitchen flooring choices. Slate does tend to be on the higher side in terms of cost, but this is offset by the advantages of this beautiful natural material. Today, there are several options for those who do not have the budget for slate yet want the look of slate. Slate is slip resistant; it can also be made stain resistant and is available in a wide range of colour textures both rough and smooth finish. You can choose from shades of brown, purple, greens and grays. 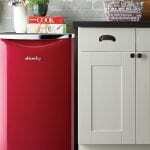 It matches just about any décor and is easy to maintain. It is durable and can last for decades. 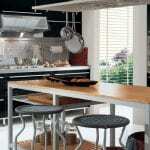 Slate is very strong and can withstand rough use, which is an important kitchen floor attribute. To keep up with optimum performance, slate must be sealed to make it slip and stain resistant. Since slate is soft, it can be prone to scratches, but this can be minimized by a yearly application of linseed oil. Some people consider it expensive which is always a downside for anything you are buying. Although some people feel slate kitchen flooring is costly, it is economical in the long run since it won’t have to be replaced very often. It is an elegant flooring choice worth investing in.